Rely on AQHI Inc. for safe and thorough asbestos ceiling removal in North Hollywood CA. The sight of lumpy, bumpy ceiling texture in homes and businesses built before the 1970s makes many people’s skin crawl. Not only is this material ugly; it could contain asbestos. This presents a health threat to anyone living or working in the building, as the ceiling could be releasing dangerous asbestos fibers into your indoor air. Call AQHI Inc. for professional asbestos ceiling removal in North Hollywood CA. Asbestos content: Being installed prior to the 1970s is a strong clue you might have asbestos in your acoustic ceiling materials. However, it is not solid proof that you need professional asbestos ceiling removal in North Hollywood CA. To be certain you have asbestos, we recommend investing in asbestos testing. Risks to future condition of the material: Of course, materials that are undamaged right now could easily become damaged in the future. Depending on how high the risk of future damage is–and how badly you want peace of mind against asbestos contamination–you may want to remove all asbestos-containing materials now regardless of condition. When a project involves handling asbestos, you want a contractor who knows what they’re doing. 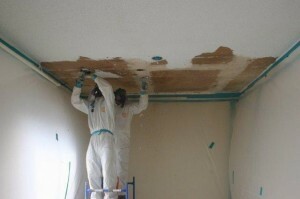 A certified contractor is especially important if your project includes asbestos ceiling removal in North Hollywood CA. In most asbestos removal projects, you “work wet” because wet asbestos-containing materials will not release dust like dry ones do. But painted ceilings can’t be wet down. Asbestos ceiling materials also generate more airborne dust simply because of their location–any dust that is dislodged will immediately become airborne. AQHI Inc. is a true expert in safe asbestos removal, and we have the certifications to prove it. We have what it takes to complete your asbestos ceiling removal in North Hollywood CA properly to leave your home in safe condition. At AQHI Inc., we treat every property with the same care we would expect for our own home. We pledge never to cut corners in the asbestos removal process but instead provide superior work and leave your property hazard-free. Contact us now to learn more about our services and/or get a quote on asbestos ceiling removal in North Hollywood CA. Our asbestos removal office for Asbestos Ceiling Removal in North Hollywood CA is open Monday through Friday between 8:00 AM and 5:00 PM and closed for lunch from noon to 1:00 PM. With advance notice, projects can be scheduled for weekends, early mornings and evenings.